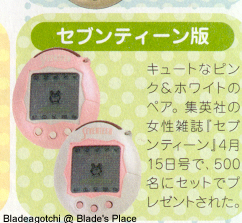 Pictured here are the limited edition Tamagotchi Plus'. I think this is all of them, but more may have been made. Note: This page wouldn't have been possible without the assistance from Mits - she graciously provided the first 6 images for no payment. Thank You, Mits! This is the White Limited Edition. Only 2004 of these were produced. 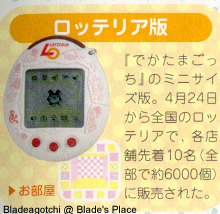 It was sold on the Internet only, on the day the Tamagotchi Plus was officially launched. There was very strict limits of one per person. The 'Vivi' pair. 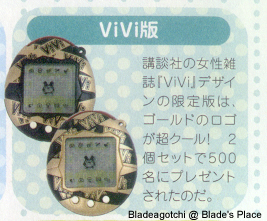 Vivi is a magazine company in Japan. These editions came out in a set of two - one of each design in the packaging. 500 sets were produced. This is the 'Lotte' special edition. Lotte, also known as Lotteria, is a Japanese Fast Food restaurant. 10 were available per Lotteria shop, which makes 6000 in total. 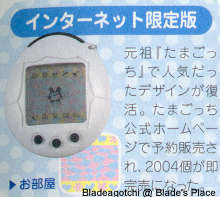 This is where you'll find the first type of Deka Tamagotchi. Special editions produced for 'Seventeen' Magazine. Seventeen is a ladies magazine for teenagers and up. 500 were produced. 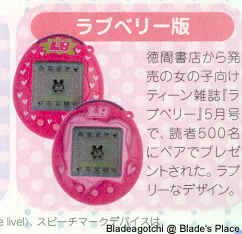 Special editions produced for "LoveBerry" Magazine. LoveBerry is another ladies magazine for teenagers and up. I'm not sure if 500 of each or 500 in total were made. Vodafone - a telecommunications company. The background on the screen is actually a Vodafone SIM card. 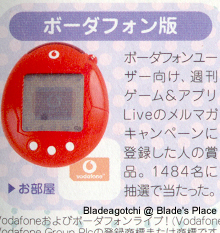 1494 of these were released, the number being the prefix of Japanese Mobile Telecommunication Device Numbers serviced by Vodafone (mobile phones, pagers, etc...but not land lines). 'Swimmer'. Swimmer is a Japanese shop and brand of accessories and products for girls. 250 of these were available via a special draw, from what I have been able to translate another 750 were available, making 1000 in total. 'Jassie'. From what I was able to translate (my Japanese skills are appalling), this is another one released for "Seventeen" magazine. I believe it is for a school festival of some description. Bandai also released a special pair for it's Shareholders to commemorate Bandai head office moving into new headquarters.